The Supreme Court, in Commissioner Of Customs, Mumbai Vs M/S Aban Loyd Chiles Offshore Ltd, held that mere repair of a vessel is not putting the vessel to use in India and would not result in home consumption, so as to constitute a taxable import. The Supreme Court, in BK Pavitra vs. Union of India, declared that the provisions of the Karnataka Determination of Seniority of the Government Servants Promoted on the Basis of Reservation (To the Posts in the Civil Services of the State) Act, to the extent of doing away with the ‘catch up’ rule and providing for consequential seniority to persons belonging to SCs and STs on promotion against roster points, were ultra vires Articles 14 and 16 of the Constitution. The Supreme Court, in State Of Himachal Pradesh vs. Satpal Saini, set aside certain directions to amend a tenancy law, issued by Himachal Pradesh High Court to the state, reiterating that the court in its judicial review cannot encroach upon the basic constitutional function which is entrusted to the legislature to determine whether a law should be enacted or amended. The Supreme Court, in NidhiVs. Ram Kripal Sharma, held that the marriage of a landlady as subsequent event cannot extinguish the bona fide requirement of a landlady urged in a release application filed prior to her marriage. Citing a medical board report, the Supreme Court on Tuesday allowed a 22-year-old woman to terminate her 24-weeks pregnancy on the ground that it would endanger her life. The bench perused the opinion of the medical board it had constituted to examine her health condition. The Supreme Court on Monday granted bail to accused Manoranjana Sinh, estranged wife of ex-Union Minister MatangSinh, in the multi crore chit fund scam. In a 2:1 verdict, the Supreme Court on Thursday sentenced Uphaar cinema co-owner 69-year-old GopalAnsal to one year imprisonment in the 1997 Uphaar cinema tragedy which killed 59 cine-goers while it kept intact the earlier order that his brother SushilAnsal’s punishment will remain the five months jail term which he already underwent. Clearing the decks for monetary compensation for the oustees of the Sardar Sarovar Project (SSP) on river Narmada in Madhya Pradesh, the Supreme Court ordered Rs 60 lakh for each of the nearly 700 families likely to be displaced. Stepping up its war against pollution, the Supreme Court on Monday said instead of various authorities submitting various reports to the court it was better for them to sit together and adopt an uniform and synchronized approach. In a huge setback to Sahara Group chief Subrata Roy, the Supreme Court on Monday ordered the attachment of the company’s prime Amby Valley property in Pune, It is approximately worth Rs 39,000 crore. A special bench headed by justice Dipak Misra said the drastic step was needed to force Sahara and Roy to expedite the payment of balance Rs 14,779 crore. A five-Judge bench of Supreme Court on Tuesday, dismissed the review petition filed by the Tamil Nadu Government and the convicts in the Rajiv Gandhi assassination case to review the December 2, 2015 judgment of the Constitution bench holding that state Governments do not have the power to remit sentences imposed in offences investigated by the CBI under the Cr.P.C. The Supreme Court on Monday sought an affidavit from Ashok Chauhan, Founder and President of Amity group of institutions regarding the suicide of an Amity Law School student SushantRohilla in August last year. On a petition filed by his friend, a bench headed by justice A K Goel is examining whether there was an “element of suspicion” that “harassment” by the instituti8on prompted Rohilla to commit suicide. The Supreme Court bench of justices Ranjan Gogoi and Rohinton Fali Nariman, on Tuesday expressed its displeasure over the affidavit submitted by the Union Ministry of Home Affairs on fencing Assam’s border with Bangladesh. The Supreme Court said it is considering direct installation of CCTV cameras in one district Court in every state, on experimental basis. The bench was considering a writ petition seeking a direction from the court for audio-video recording of the proceedings of a trial court to ensure fair trial. However, the bench said it limits the issue raised in the petition to consider whether CCTV cameras (without audio recording) can be installed in courts or at some other locations on the court premises with the monitor being in the chamber of district and sessions judge. SC issues notice to Justice Karnam to explain why contempt proceedings should not be initiated against him, and also appear personally before the bench on February 13. 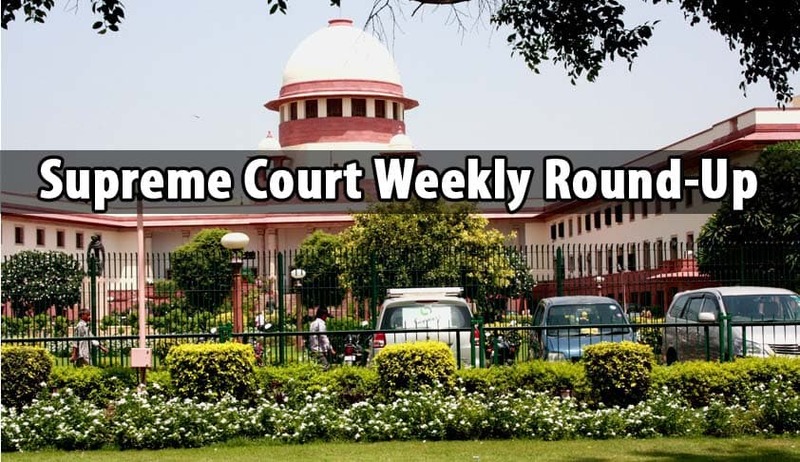 The Supreme Court bench of justices Madan B.Lokur and Prafulla C Pant, on Friday, directed the Centre to notify the Wetlands (Conservation and Management) Rules, 2016 on or before June 30, 2017. “There has to be some finality to the publication of the Rules, as the matter has been pending with the Centre for long”, the bench observed.